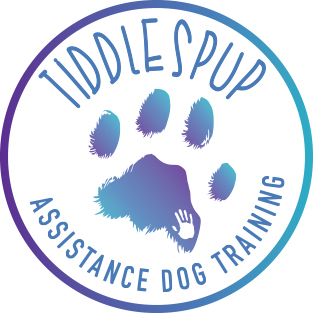 Tiddlespup trains people with disabilities to train their own assistance dogs, our program is available long distance or in person, we service regional Queensland and elsewhere if the need arises. Our program is very individualized and because we are training you to train your dog, you and your dog set the pace. Tiddlespups specializes in working with autistic child handler teams, whilst also working with people of all ages and with many different disabilities or medical conditions. We offer assessments for both prospective handlers and prospective assistance Dogs. Tiddlespup is able to assist with a range of training needs; basic training, troubleshooting and task training. We are proud advocates of positive reinforcement training techniques, because if your dogs are rewarded for their job, and have fun training, they’ll continue to love doing it, and that’s what we want. Currently our clients are QGHAD accredited with a third party assessor, whilst Tiddlespup awaits assessment from Queensland Guide, Hearing and Assistance Dogs. Tiddlespups QGHAD Public Access Test will be available upon completion of aforementioned assessment and accreditation.